TechSupport called while he was away at overnight camp. I knew something had to be really wrong to get a phone call. He had to be sick. Or dying. Or have head lice. He called to ask permission to get a mohawk. “It’s for the Fight Song. Can I do it?” he asked. “Sure,” I said, knowing my husband always gives Tech a good brush-cut before school starts in September. “Hi, Renée.” I heard the director smiling through the phone. Also, if you like to vote, head over to Rob Shep’s awesome blog where he is hosting the 2nd Annual Blogging All Star Challenge, and vote for Team Ricky. Right now, only 3 votes separate the two teams. This is tight people! I’m the chick in green — not the one with the mustache — in case you couldn’t tell. Wes Molebash didn’t know about my crazy curls. But boy did he create awesome caricatures of everyone. This entry was posted in Summer and tagged haircuts, Parenting, Photograph, summer camp, surprise phone calls. Bookmark the permalink. So relieved to know it ultimately grows back! He has a very short brush cut right now. It’ll be perfect before school starts in a few weeks. Hopefully. He definitely had fun. We called it a “Schmo-hawk” initially! But at least the camp called to prepare us, right? I’m surprised my son hasn’t done this already. I think it’d be fine because he normally sports a super short buzz cut all year long. He was feeling’ it! He loved July, and his first words when he got off the bus were: “Next summer, seven weeks!” I’ve lost him. It’s awesome! Everyone should have a wild hair experience at least once in their life. When I was 16 I went to London with 2 friends on February break. One of my friends was 17. She was our chaperone. We all went to a salon in London. They both got highlights. Since my hair was much darker, the stylist recommended lowlights. So, I got lowlights. Red. Not, a nice auburn. Red. Fire Engine Red. And, no, I didn’t call my parents from London to ask if it was OK. I just went for it. They loved it!! OK, they actually asked if I spilled paint on my hair. But, they were basically OK with it. I think. Awesome hair story. Even I shaved my hair back in 11th grade. It was a disaster to grow out, and I’ll never do it again. I think I destroyed all the pictures. Maybe a few from camp remain. Ugh! Long bangs and short hair. That was so 1980s. But I forgot I had curly hair. Or something! Hi Renee, I love it! Being young and doing (safe) crazy things is what summer break is all about. My youngest daughter wanted to add colorful extensions to her hair. The yes from me didn’t come as quickly as yours did, but it came, and her hair ended up looking cute. Ha! I don’t know what I would think. I would probably be amused and take some pictures. It reminds me of when I was away at band camp and dyed my hair (just a slightly darker color of brunette – nothing more exciting than that). I, however, did not ask my mother’s permission until *after* the event, and her response to my request was “no.” So I lived in mortal fear of her reaction when she picked up me from camp. Thankfully, the color was so close to my original hair color that she didn’t even notice! When I ‘fessed up, she told me that she only said no because she thought I was asking if I could dye me hair blue, or purple, or something like that. So glad tech loved camp. That’s the best. So funny that your mother didn’t even notice! LOL! Hilarious! It’s only hair. It’ll grow back. I definitely wouldn’t have a problem with it. I keep hoping that while my kids are at camp, they’ll go and do something really stupid, just like I used to do. It’s part of growing up. I used to “bleach” my very dark brown hair with lemon juice (poor mans sun-in). I once bleached it, then dyed it with Kool-Aid… Cherry Kool-Aid. All it really did was give me some cool auburn highlights. My mom thought it was pretty stupid, but never really complained about it. I’d feel proud! He’ll remember this for the rest of his life. He might even blog about it someday! I think he will always remember it. Even if he doesn’t, I’ve got this picture to remind him of his “Schmo-hawk”! Oh Renee, I’m soooooo old that I’d just be grateful for an intact head and body! It was always interesting to watch how the little boys in my classes emulated one another. If one got a Mohawk, they would all try to create little banks of head-topping hair. It’s pretty adorable. I like it. 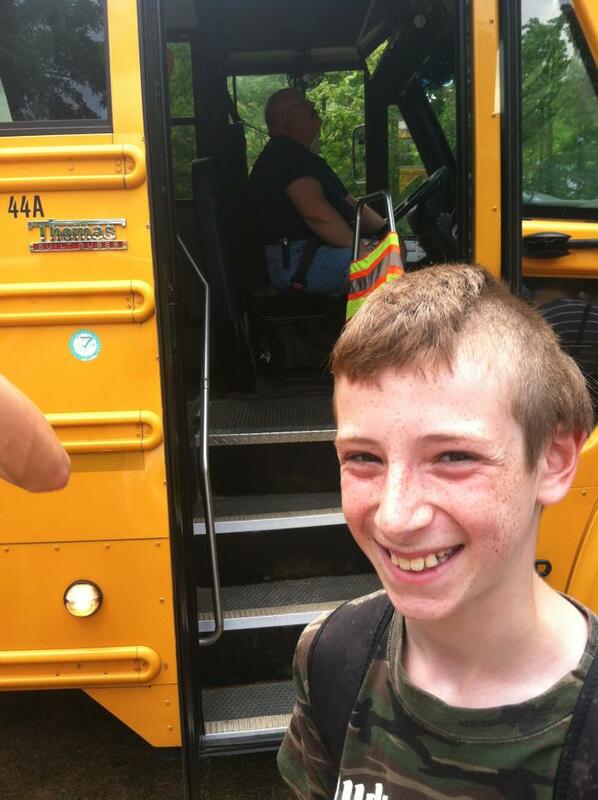 I broke up with my 7th grade boyfriend because he got a mohawk. I didn’t even see it. It’s gone now. He’s got a brush cut. But he was proud of himself for doing it. For the team. You’re such a great mom! I LOVE it. The hubs and I are currently trying to talk are 3 year old Monkey INTO another Mohawk! He isnt budging yet!!! Our…not are. And to think I am a teacher. after four weeks I would just be glad to see him – and what a charmer he is! I was so glad to see him! He was super psyched to be home but he is ready to go back all summer next year. I see many Mohawks in his future! I’m starting to get that picture. So adorable–love it!! !What a good sport your son is in several ways-the haircut, the picture–good stuff! He actually lost a bet, so he didn’t get the full thing! Can you imagine? What a clown! But he was a happy little man with his Schmo-hawk! Love it! I’d allow it too if he agreed to buzz it or whatever before school! I’m kind of old-fashioned I guess. Meanwhile, baby Nate has a natural mohawk. For real! Already buzzed! LOL! He wanted it buzzed immediately! Been there done that. The boys hair grew back. Haha. wait until they ask for a tatoo! Yikes! Something tells me that this one isn’t going to go for that. He has seen how my tattoo has weathered, and he isn’t interested in the whole trend. In fact, I was really surprised he wanted to do this because it WAS the trend. But — ever pragmatic — he explained, he knew he was going to get a brush-cut before school anyway, so why not have a little fun? No, this one won’t be interested in tattoos or piercings. Taking apart my phone? Yes! Dissecting my computer? Yes yes yes! Doing something to his body? Not so much. Then again, all that could change. Right? lol, you never know. He sounds like a great kid! LOL, hair grows back – far better than piercings and tattoos. And he called to ask, that was sweet. The call was mandatory. In the old days, we used to just cut our campers’ hair. I’m guessing some parents didn’t like that! Smart to get permission! I love it! It looks good on him. I came back with that exact haircut once. Haha! I would think it was totally awesome! You’re only a kid once, right? I wish I was brave enough to do something like that – a little bit, but not too crazy. And that is the truth. You only get to do these things for a finite time. Unless you work in a tattoo shop where you can do any freaky thing you want to your person. PS My DD loved camp! I missed her every night. I think it was more of a growing experience for me than her. I wonder when the tipping point was that mohawks went from “dangerous/ anarchy/ hate” to “sports/ fun/ playful”. There had to be a moment, didn’t there? Maybe right around the time when the mohawk-mullet combination appeared? Hubby said Mr.T made the Mohawk a less intimidating hair style than when it was associated with the whole Sid Vicious Punk Rock movement. I don’t know. All I know is that today at the water park? At least 16 people were sporting them. I would have counted, too! Because I like to know things like that – the exact number kind of things. Well, everything comes back around…and around. That is the most “interesting” cut I’ve seen in while: leaving hair around the ears. I’ve shaved mine, in recent years even. So I totally get the mohawk with the pack. Nothing wrong with that. Can you imagine? You know the lice thing is my own personal horror. Oy! No, he’s happy! And also, the faux-hawk is gone. oh my gosh your team is the BEST! You have Jamie AND the good greatsby. There’s no contest! It was so close last night. Must go look this morning! My husband had a mohawk for his senior class picture about 2 million years ago. His mom never forgave him. Sorry I didn’t get to the contest in time to vote, but you won anyway. Congrats! Yay to you for saying yes. I remember how pleased I was when I had my hair cut from very long (able to sit on it) to shaved the summer I finished school … and I still remember the stunned look on my mother’s face when I walked in the door!!! He’ll remember that you said yes every time he remembers the haircut.